Are you going to miss your train? How do you know when it’s time to throw in the towel? Do you stay with a project or endeavor too long? Or not long enough? “Never say Never!” he quickly replied. Gerald Murphy was his name and already from our conversation in the cab, he had demonstrated his indomitable Irish spirit. I looked at my watch. We had just ten minutes. Even in regular traffic, we’d be unlikely to make it in my opinion. 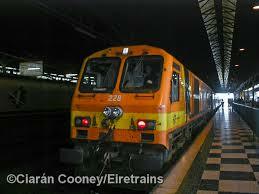 I began to tap in Iarnród Éireann (Irish Rail) on my phone. 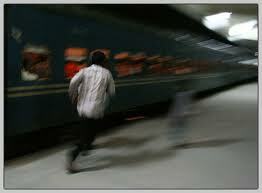 The next train didn’t leave until half-past nine. I wouldn’t get down to my home in Cork until almost midnight. Ah well. Some things you can’t control. I’d call my husband later and let him know. I wasn’t angry, mind you. Simply resigned. To my mind, missing my train was a done deal. Her point was that we shouldn’t be blindly optimistic, but rather strive for a more realistic, balanced approach. I agree. Then suddenly, as if an Irish fog had swiftly lifted, the train station was clearly in front of us. Ger zoomed over to a side parking lane right next to track eight where my train was still waiting. “You’re going to make that train, Love!” he chirped. He was already up and out of the car, opening the boot for my small suitcase. I glanced down. Two minutes to spare. Ger may be right! That NYT article also stated that “positive thinking fools our minds into perceiving that we’ve already attained our goal, slackening our readiness to pursue it.” For that, I don’t agree. Ger didn’t slack off. Instead, he pushed on. Positive thinking didn’t trick him into believing he had something he didn’t have. Instead, in the face of difficulty, it may have been the very thing that kept him determined to keep going – to keep striving. To NOT give up. Simply THINKING positively and NOT DOING anything, is of course, not enough. You’ve got to keep going. Keep driving to your goal. Yes, the trick is not to only imagine smooth, open roads. Picture the traffic jams, too. And then strategize how you will manoeuvre through different routes. I grabbed my suitcase from Ger and handed him the fare- plus a healthy tip. Then, right before I started running, I made sure to express my sincere gratitude and wish him all the very best. And after the kindly Irish train attendant had leaned out and signaled to me that he saw me and that I could stop my sprint, I did make that train. With seconds to spare. Thanks, Ger, for reminding me to never say never.